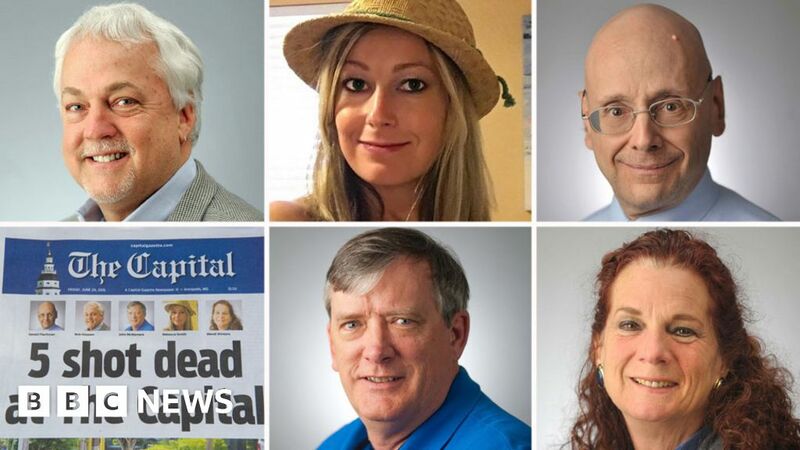 2018-06-28 A shooting at the office of "The Capital" and the "Maryland Gazette" newspapers in Annapolis, Maryland, United States, kills five people. The suspected shooter is detained by local police. 2018-04-16 The annual Pulitzer Prizes, which celebrate US journalism, are awarded. "The New York Times" wins the most with three. Pieces on Donald Trump and the #MeToo movement feature prominently. 2017-08-18 The 145-year-old Roger B. Taney Monument outside Maryland State House in Annapolis, Maryland, is removed overnight by authorities. Maryland Governor Larry Hogan called on Wednesday for the monument to be taken down immediately. 2017-05-11 The Federal Bureau of Investigation raids a Republican fundraising firm in Annapolis, Maryland. 2016-04-18 The Associated Press wins the Pulitzer Prize for Public Service for documenting the use of slave labor in Southeast Asia to supply seafood to American tables.